Check out over 100 great photos from last Sunday's Miami Bike Polo courtesy of Slipstream Photography. There's currently four active clubs playing bicycle polo in South Florida. If you want to check out bike polo come to Holiday Park in Fort Lauderdale this Sunday, September 8th at noon. They'll be hosting a fun bike polo tournament and BBQ with players from all around Florida. We typically play in Miami on Sundays but are making an exception this week to take part in the tournament. New players and spectators are always welcomed. 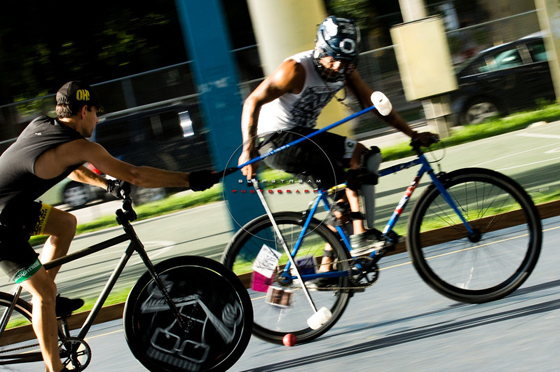 Also, the World Hardcourt Bike Polo Championship is taking place in Weston, FL October 16-19 2013. It will attract the best players from around the globe. Teams from USA, Germany, Spain, Brazil, France, UK, Australia, Canada, and more will battle it out for the championship title. This is a very special annual event which just happens to be taking place in our backyard this year.